Odd title I know but I was recently diagnosed with gallstones and if any of you have felt my pain you know it’s no joke. It’s a complete overhaul on how you eat, which inspired this fall vegetable soup. We belong to farmfreshtoyou.com and we had forgotten to pre-set our order for the week so they picked for us, sometimes it’s kinda fun, and in this case, as a result, we got a HUGE head of beautiful zucchini. In my mind, I wanted to make cream of zucchini soup. Anyone with gallstones knows that’s just nuts, the cream that is. So here’s what I did. 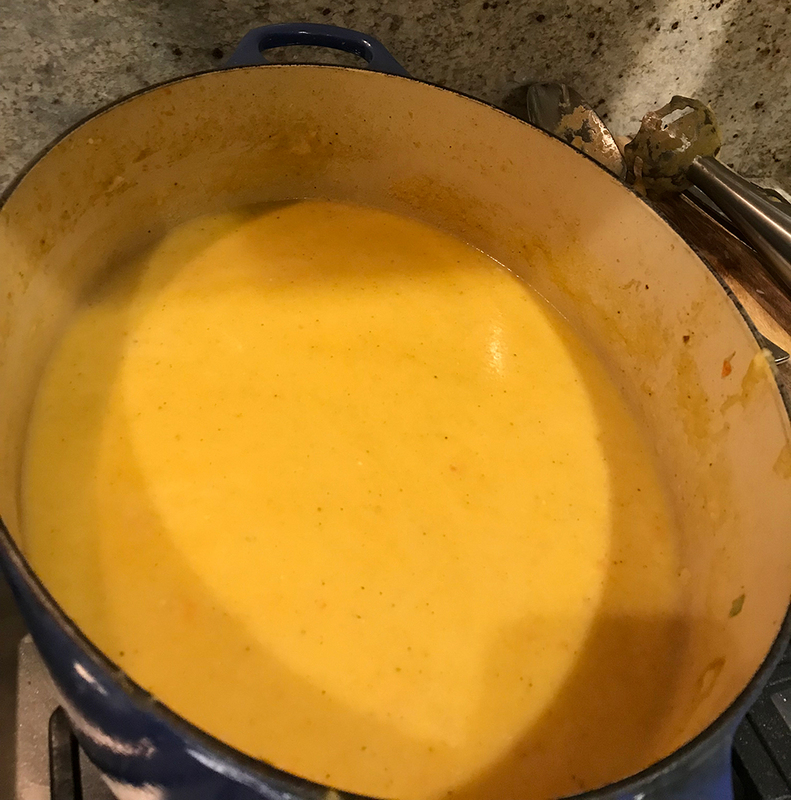 Before I go any further I will tell you rather than just straight cream of zucchini soup, it ended up being beautiful zucchini with “I need to cook these veggies before they go bad” soup. Rubbermaid storage containers when the soup is finished. As always this time of year making soups, stews, or anything with a decent amount of liquid, I started with my trustee LeCruset. I’ve had this pot for close to 10 years. If I said it was versatile it would be an understatement. My favorite thing about it is the ability to brown meats and then finish it in the oven. If you like stew, or roasts this will be your kitchen staple. From a knife perspective I went with my go-to Shuns I used a large 8 inch, and also a 5 inch. They make cutting veggies a dream. Also if you have a Sur La Table near you they will sharpen them for you for a small fee. It’s well worth it, and I think each store is a little different so you should probably check with them if you’re curious about pricing and availability of the service. When I walk through the mall with all these knives I’m thinking to myself I probably would seem like a crazy person if people knew I was carrying around all those knives. For the produce, I started with 1.5 medium yellow onions. We had one from farm fresh, and one I had picked up at Target. While we try to be as organic as possible in our home it’s not always practical, I have a full-time career and my man owns his own businesses so none of anything I do is time-consuming or intricate. Speaking of Target, my go-to cutting, chopping and even serving chaterutery one we got from there. We get a ton of compliments on it, and it was super reasonably priced, under $30. I don’t know about you but I get lost at Target, even just talking about it I get sidetracked and want to spend 30 minutes in that $3 aisle when you walk in. So back to the soup also from farmfreshtoyou.com I also had carrots, a red pepper, and some Yukon gold potatoes. I only used one of the potatoes to thicken it. I used about four to six inched average white guy carrots, sounds weird but it’s a running joke in our house. The zucchini I keep talking about and also about five stalks of celery. 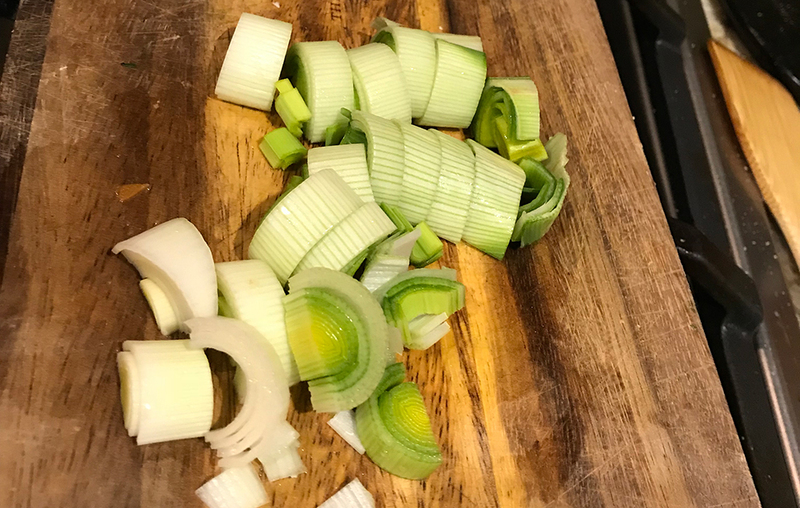 Honestly, it was probably too much celery but it needed to be cooked, when I first tasted the soup, I even said “geese, tastes like celery” so I ended up adding a small can of coconut milk. This helped change the flavor a bit and give me the creamy taste I was dreaming of without adding animal protein or dairies such as milk, cream or butter. I used a full tablespoon of olive oil to sautée the veggies, that I got from Williams Sonoma. I feel like olive oil, good olive oil is a staple in any kitchen. It makes a huge difference in the flavor of your food from what you sautee to salad dressings, and even drizzling over roasted veggies. After chopping all the veggies, starting with the carrots, onion, and celery, I added them to a hot pan. Followed by the zucchini, red pepper, about 5 cloves of fresh garlic and plenty of salt and pepper to taste. I’m always tentative with salt, in my early cooking days I used too much a couple of times and as we all know there’s no going back from that aside from tripling whatever you’re making to try to balance out the flavor. I don’t care what people say adding a potato to absorb the salt has never worked for me. 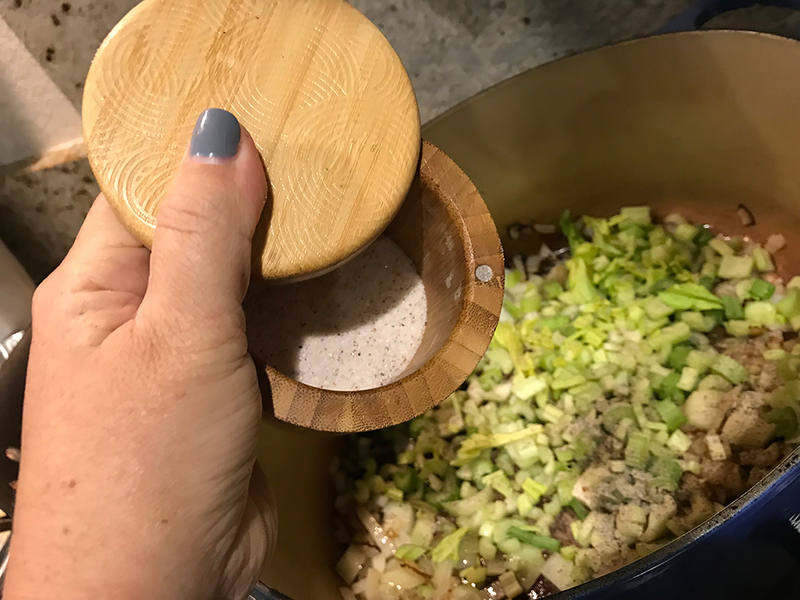 Once I had all the veggies chopped I poured two whole boxes of organic chicken stock over the top and let it rip with the heat, I wanted to cook these veggies down so they would melt in the immersion blender. 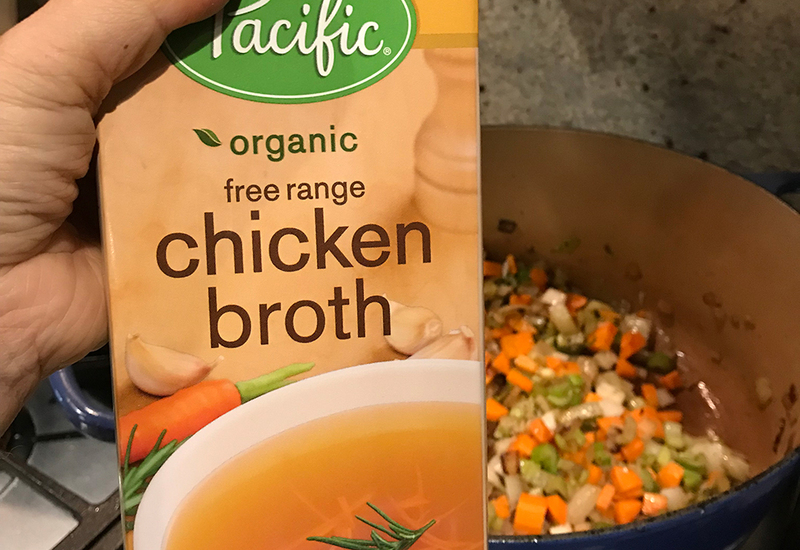 The chicken stock I got on amazon prime now…true to self I swore up and down that I had stock on hand when indeed I did not. Prime has saved my bacon so many times. Now the next thing I just mentioned is my immersion blender. I’ve had this thing for quite some time and it is just awesome. From soups to smoothies for my munchkin, to making pesto it’s so good for multi-tasking. It’s by Cuisinart and I’m sure there are newer ones out there but I think this is a good investment. I shouldn’t even say investment because it’s seriously under $200. I might have to do a comparison blog or a cooking with gallstones special for Christmas. Add some curry powder, red, green or yellow. If you want you can add a little nutmeg and cinnamon if you have a pumpkin spiced latte flavor pallet. For those in your family, you can chop chicken, beef or ham and sprinkle on top for protein. Serve with garlic bread, or French bread, or crackers. Reserve the carrots after cooked and add them back in as whole chunks for a little different texture. Sprinkle with fresh herbs and Parmesan cheese.